Visualize numeric values on a circular scale using the ASP.NET MVC Circular Gauge control with built-in animation, tooltips, and multiple axes support. A circular gauge can be used to create a speedometer, meter gauge, multi-axes clock, direction compass, and more. The ASP.NET MVC Circular Gauge is ideal for visualizing numeric values over a circular scale. A circular gauge, also known as a radial gauge, can be used to create a speedometer, meter gauge, multi-axes clock, modern activity gauge, direction compass, and more. All circular gauge elements are rendered using scalable vector graphics (SVG). The gauge axes are circular scales where a set of values can be plotted based on any business logic. You can easily change the appearance of the axes by customizing the labels, major and minor ticks, axis line, and flow direction. A range in the circular gauge is a visual element that helps to quickly visualize where a value falls on the axis. Position, width, color, start and end values of the ranges can be customized. Also, you can add any number of ranges to the gauge. Indicate values on an axis using pointers. The ASP.NET MVC Circular Gauge control supports three types of pointers namely needle, marker, and bar. Position, color, shape, tail and cap of the pointers can be customized. Display any HTML element as an annotation at a specific point of interest in the circular gauge. You can also add multiple annotations in a gauge. Enrich the visualization by adding the built-in interactive features such as tooltip, animation and pointer drag in the ASP.NET MVC Circular Gauge control. 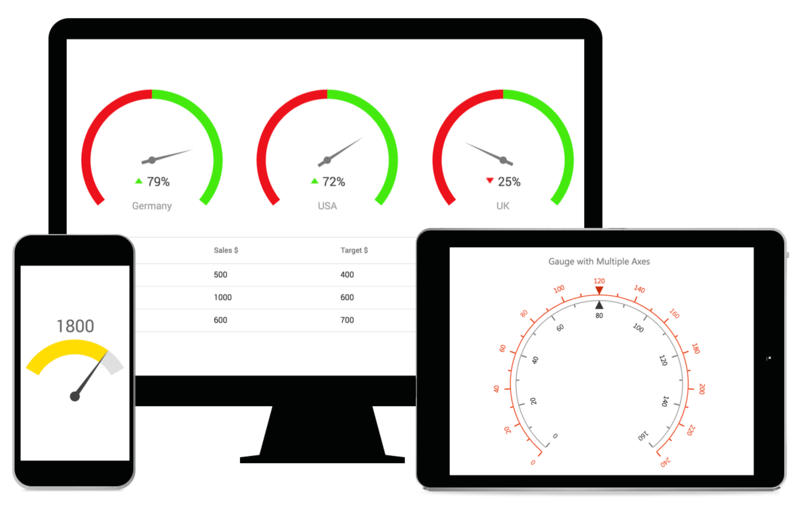 The ASP.NET MVC Circular Gauge is highly responsive and has a finely optimized design for desktops, touch screens, and smartphones. It works well on all mobile phones that use iOS, Android, or Windows 8 OS. The complete appearance of the circular gauge can be changed to the desired style. Built-in support is provided to customize all the element's font, color, opacity, border color, border width, etc.